Skin works hard. Putting aesthetics aside for a moment, our health relies on our skin to protect us from our environment, make Vitamin D, regulate body temperature, boost immune function. It allows us to interact with our environment and senses the world around us. We expose it to so much stress through lifestyle, sun damage, oxidation and lack of nutrition. So when you understand the demands of the skin you realise that every ingredient within a formulation needs to be working hard. Obvious right? But when you look at the ingredient listings of many cosmeceutical ranges there sure is room for improvement. I’m not saying that many products don’t have the right levels of cosmeceutical actives. They do. Sometimes though, the rest of the formulation is left a little bit empty. Water, glycerine, mineral oil and other synthetic fillers often make up the balance. And look, while it’s not so much that these ingredients are bad for you. It’s more that they are just a little bit lazy. These are the ingredients that lack nutrition and benefit. Nor can they effectively penetrate the skin. It’s the opportunity cost of action-packing our cosmeceutical formulation with nutrient rich botanicals the skin needs to metabolise and function at its youthful best. Think about your diet. The complexity of vitamins, minerals, trace elements, amino acids, protein, enzymes, antioxidants, omega rich fatty acids which fill a plate to optimise health. Considering skin is our largest organ weighing in at a hefty 3.5 kilos and covering around 2 square metres, I’m really very surprised we are so relaxed exposing it to an abundance of synthetic chemicals that we would never be comfortable ingesting from our dinner plate. The demands of our skin are no different to any other body organ. So how about this. Why don’t we make the complete ingredient listing active? Let’s combine anti-ageing corrective cosmeceuticals with age-proofing naturopathic infusions to correct and repair while we nourish, nurture and replenish. There are many reasons that the skin ages. Irreverent sun exposure, naughty lifestyle habits, oxidative stress, but most importantly inflammation. The inflammatory response is the precursor to not only signs of ageing but all disease. Wouldn’t it be sensible to instead of continually correcting skin concerns, we focused on prevention instead. Ingredients with anti-inflammatory properties work to age-proof the skin to deter the signs of ageing. I think of it like this, better to build more pedestrian crossings than build bigger hospitals. The SPACEUTICALS Collection integrates green and clean cosmeceuticals with omega rich botanical bases to provide an anti-ageing corrective solution while age-proofing with naturopathic infusions of botanical nutrients. At the heart of the SPACEUTICALS collection is a meticulous selection of clinically tested actives dispensed in therapeutic concentrations. These are captured in a blend of powerful phyto-actives. Think resveratrol to boost collagen, skin perfecting niacinamide, coenzyme Q10 to reverse wrinkles, alpha lipoic acid to protect against ageing and oxidation, folic acid for DNA repair, Vitamin C for connective tissue, AHA’s and BHA’s to refine and resurface, along with anti-ageing vitamins, probiotics and the list goes on! 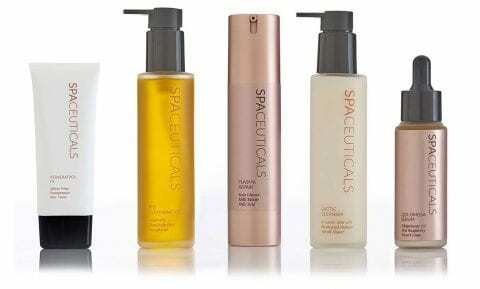 SPACEUTICALS actives are delivered using a patented micellar encapsulation technology; a unique delivery system which captures performance actives along with fat soluble vitamins and antioxidants to ensure deeper dermal delivery with longer lasting activity. Waterlily has worked with an exclusive nutraceutical delivery system designed in Australia to increase the bioavailability of lipophilic active ingredients. This is compatible with omega rich products, vitamins and cosmeceutical compounds and is made from pharmacopoeia grade ingredients under TGA standards. It’s the naturopathic approach to formulating that makes this a stand-out clean and green cosmeceutical collection. Marrying the intensity of an omega rich base with high potency fruit, flower and herbal concentrates to deliver an ingredient listing drenched in nutritionally rich actives. Essential fatty acids cannot be produced by the body and external sources are vital to promote healthy glowing skin. Within the skin, these omega rich compounds are responsible for maintaining cell integrity, protecting the skins natural moisturising factors, promoting collagen synthesis, enhancing skin immunity, supporting cell metabolism and generally maintaining a healthy complexion by improving tone, texture and luminosity. But most importantly, cold pressed plant oils have a preventative effect on ageing. Inflammation is the precursor for all skin disorders especially those associated with compromised skin conditions. Essential fatty acids are powerful soothing agents which reduce inflammation before the damage is expressed. The ideal pathway to combat premature ageing and remedy skin concerns. Preventative medicine at its best! We also understand that complexity and intensity is key. There is no single magic bullet. When it comes to feeding our skin the nutritional demands it requires are broad. Instead of just using purified water the SPACEUTICALS formulations have harnessed a rich source of natural ionic sea minerals to support and enhance skin function. A super concentrate of over 45 essential minerals and trace elements have been extracted from pristine Australian ocean water. Using solar evaporation to precipitate rich macro minerals and trace minerals resulting in a 1:100 food grade concentrate from volcanic rich ocean sources. With most of the sodium naturally extracted the concentrated liquid is a mineral laden solution to promote cellular metabolism and optimal skin health. Think magnesium, selenium, zinc and so so SO much more. Housed in elegant rose gold packaging the SPACEUTICALS Collection is an edit of 10 high performance multi- functional products. Airless serum dispenses and artisanal blending methods protect the freshness and integrity of each hand crafted batch. Each product is lovingly created at the WATERLILY head office in Brisbane. The Collection includes a Bio Cleansing Oil; 10% Lactic Cleanser; Hydra C Mist; Resveratrol FX; Thalasso Smooth with 2% salicylic acid; Phyto-B3 Serum with 5% niacinamide & hyaluronic acid; Q10-Omega Serum with 1% Q10; 100% Pure C + Peptides; Cell Therapy Skin Treatment; Plasma Repair Skin Treatment.